have become one the hotter popular attractions in the lower Key's. Back country tour guides will show you tropical mangroves, pristine beaches and remote out of the way islands, reachable by kayaking only. You will be a witness to some of the most amazing scenery in the Florida Keys. It's almost a guarantee that you will witness an amazing amount of local aquatic creatures and a wide range of marine life on each excursion. Make sure you plan a kayak adventure to really enjoy the surrounding beauty of Key West and the lower Key's. The Lazy Dog is our first choice for Key West kayak and paddleboard rentals. Their convenient location and proximity to many of the islands mangroves makes Lazy Dog the perfect combination for your kayak or paddleboard adventure. If you're lucky you may even spot a manatee while exploring the calm and pristine waters surrounding the island. With Lazy Dog you will have the option to have a guide for a two hour eco tour or you can choose a four hour kayak and snorkel eco tour. Lazy Dog also gives you the option to rent & go on your own if you are the more adventurous type (maps included)! Great for the beginner or experienced kayakers. Lazy Dog provides both single or double kayaks. They will also provide free transportation for all their tours. Enjoy the family oriented kayak tours offered by back country kayaking tours. 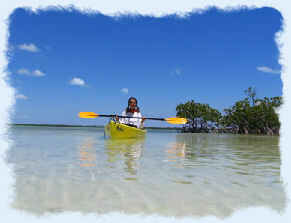 They feature unique tours to Sugarloaf Key and trips to the calm and peaceful back country waters of Sugarloaf Key. View and abundance of wildlife, snorkel swim, or search for sea shells on a remote beachs at low tide. They offer competitive prices, single or double kayaks and snorkeling gear for each of their guests. They specialize in private charters that are flexible to your schedule. Their forty seven foot yacht, Blue Ice is the perfect vessel for snorkeling, dolphin watching and sunset sails. The boat provides the ultimate wedding ceremony location and has hosted over 500 private marriages. They offer complimentary beer, wine and champagne as part of your sailing experience. Blue ice sailing is just a short distance from our condo rental so be sure to add them to your list of things to do while in Key West. 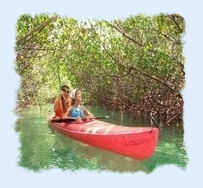 Eco Tours to kayak accessible only mangroves and remote beaches. Tours are led by environmental scientists with extensive knowledge of the tropical surroundings and they will educate and guide you at the same time. Night and custom tours are available as well as transportation if needed. The Blue Planet limits their kayak eco tours to a maximum of ten guests so that you will experience a personal and unique tour. You will need to book your eco tour in advance which you can do on-line by checking their availability calendar. behaviors. She will provide you with lots of informative info on the amazing marine ecosystem that makes up the lower Florida Keys. They have two custom boats available and include snorkeling equipment, beach towels, snacks and beverages with your trip. Be sure to add this adventure to your list of things to do while on your vacation. Located at the Key West Historic Seaport, Margaret St. Entrance Key West, FL 33040 . They are just a hop, skip away from our Key West Vacation Rental and World Famous Duval St. The Catamaran Echo provides a truly unique experience since they are the only sailing catamaran in Key West that is used for dolphin encounters. No need to worry about overcrowding with your voyage on the Echo. They limit their passengers to only half of their maximum capacity on their dolphin eco tours. The crew will provide snacks and beverages while on your eco tour and their excursions usually last about four hours. National Park and historic Fort Jefferson. scenery in the lower keys. everything you can imagine for water activities. Fury offers many adventures that are fun and safe for the entire family. Other adventures include: jet ski rentals, air conditioned glass bottom boat tours, eco tours, kayaking, snorkeling, rock climbing, water trampoline, and sunset cruises. Located next to the Westin Hotel and 245 Front Street Key West, FL 33040 Be sure and bring your photo gear with you when you take the 3 1/2 shark tour. 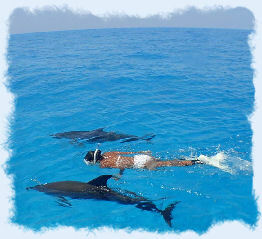 Skipper Harris has over 30 years experience in guiding in the Keys area. His specialty is in locating large sharks for your viewing pleasure. Of course sharks are just one of the many creatures you may encounter on your trip to remote and exotic back country locations. They won't feed the sharks but they sure do a good job of feeding and watering their hungry passengers as part of their trip. SEBAGO CATAMARANS & WATERSPORTS -Snorkeling Adventures! Sebago watersports offers practically every water activity known to man plus a few others. They are one of the largest outfitters for watersport activities on the island. The Island T'ing excursion includes: Catamaran Sailing, Snorkeling at the Reef, Kayak Mangrove Exploration, Fresh Fruit Platters, Homemade Sangria, Beer, Wine, and Soft Drinks and a Buffet. So if you're looking for an all inclusive Key West adventure then Sebago would certainly be a great choice. SUNNY DAYS - SUNSET SAILS AND TRIPS TO THE DRY TORTUGAS! Located at the end of Elizabeth and Greene St. In the old historic harbour. They have dolphin trips for only $55 for adults and $45 for kids. They offer a number of options for charters including dolphin encounters, snorkeling adventures, trips to the Dry Tortugas and many other water sport activities. Sunny Days features catamarans for all their sailing excursions and they offer a 10% discount when you pre-book your tour or adventure online. They are one of the larger providers of Key West water sport rentals and tours.